Yogi Berra is one of the best known baseball players of all time. For most of his nineteen year career, he was the super star catcher for the New York Yankees. Casey Stengel, his long-time manager, said of Yogi, "I never play a game without my man." His records and awards are both astounding and far too numerous to mention or attempt to recap here. However, if you are curious, check Wikipedia for his records along with his history. 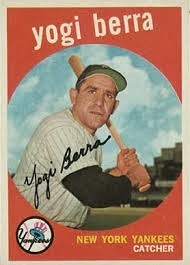 Besides playing, Yogi was also a coach and a manager. However, as time passes, it's his career as a writer and commentator that most people remember. Quotes like these have assured Yogi a place in history that I'm convinced will surpass his membership in the Baseball Hall of Fame. "It's deja vu all over again," which he said after watching team mates Mickey Mantle and Roger Maris repeatedly hit back-to-back home runs. And there are the classics, "You can learn a lot by watching" and "When you come to a fork in the road take it." A lesser known Yogi quote that recently caught my attention is: "You can't think and hit at the same time." Like most Yogi quotes, when you get past the humor of them you find a simple and profound truth. I've come to know, not always the easy way, that human beings cannot "multi-task." We do have the ability of quickly, though not effectively, shifting our attention from one thing to another, which some people have mistakenly identified as "multi-tasking." However, unless you're just into doing sloppy work or have a death wish regarding texting and driving, attention shifting is not the answer to getting the most out of every moment. Doing one thing at a time and doing it the very best you know how to do it is the only sure way to success an longevity.